‘The Old Boathouse’ on Coos Bay in Oregon where Don Barber served in the US Coast Guard and built and repaired wooden fishing boats and tugs. Many of these vessels are still working the tough waters of the Pacific Northwest today. 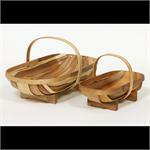 When Don retired from shipbuilding he started building baskets. What started as a pastime soon became an enterprising endeavor for the whole family as the baskets became popular and word quickly spread. Martha Stewart, Joan Kennedy and stores and catalogs such as Williams-Sonoma, Bath and Body Works, Bergdorf Goodman’s, and many more were soon ordering Barber’s Baskets. Many notable publications have used photos of the baskets in their feature layouts and advertisements. Magazines such as American Homestyle and Gardening, Gourmet, Sunset, Organic Life, McCall’s, Country Living, Metropolitan Home and others. The trugs were listed in the gardener’s gift pick columns of The Washington Post and The Wall Street Journal and used on the sets of the movie, Julie & Julia. We still use Don’s original basket building methods starting with selecting and milling the logs for the best kind of basket making wood. We use solid cut copper nails that are made in the USA and finish the baskets with clear mineral oil to let the Myrtle’s beautiful hardwood grain show naturally.